I was going to write a long post about why Mark and I decided to sink this year's retirement money into farm infrastructure (aka paying Bradley to build us things) rather than putting cash in the bank. About how it's just another example of the homesteading motto: keep your eyes open for opportunities and then seize the day. We figure Bradley's obvious skills and expanding confidence will soon put him out of our league, so we're accepting every possible minute he can spare to make our farm more self-sufficient until that inevitable day comes. But I suspect you don't really care why so much new infrastucture is coming to the farm this summer, and would rather read about how it all happens. So here are lessons learned from porch 2.0. With porch 1.0, we had already bought four by fours to support the roof, but Bradley was involved in the supply run this time around and had other ideas. 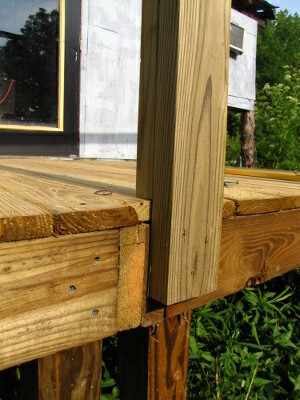 He explained that using a pair of two by fours for each support post is just as sturdy as using a four by four, and also allows you to attach the post more securely to the floor (as you can see here), all while costing significantly less. The only downside of this method is that you end up with a support that's 3 inches by 3.5 inches rather than one that's 3.5 inches by 3.5 inches, but that won't be an issue if you're not trying to put heavy things on top. 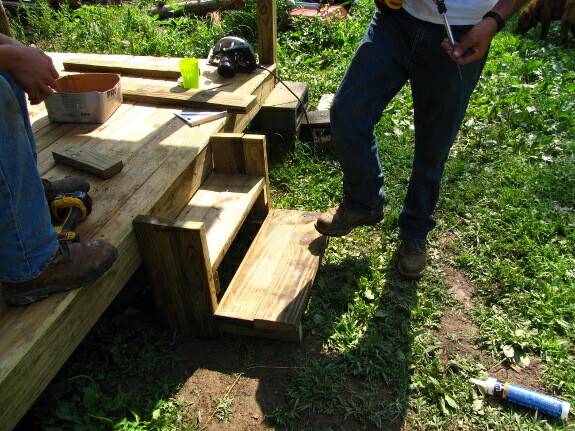 Next, Bradley asked why we'd buy inexpertly-cut stair risers when he could make a more stable set of steps out of dimensional lumber. He built the simple stairs above for the uphill side and the enticing steps to the right and below for the downhill side. 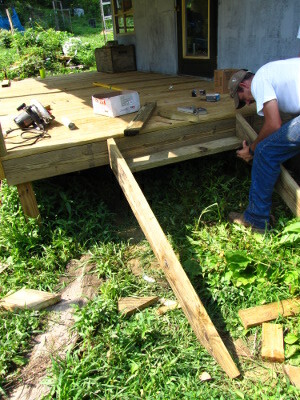 In both cases, Bradley cobbled the staircases together out of odds and ends we had leftover from other projects. 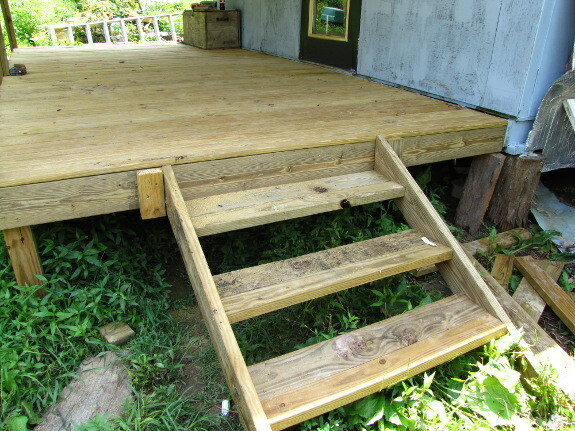 You can see that each step is made from multiple boards so that we didn't have to rush to the store for wider planks, and that the stair steps on the downhill side rest on little pieces of lumber attached to the inside of pairs of slanted boards. This is all treated lumber since the area gets extremely wet in the winter. 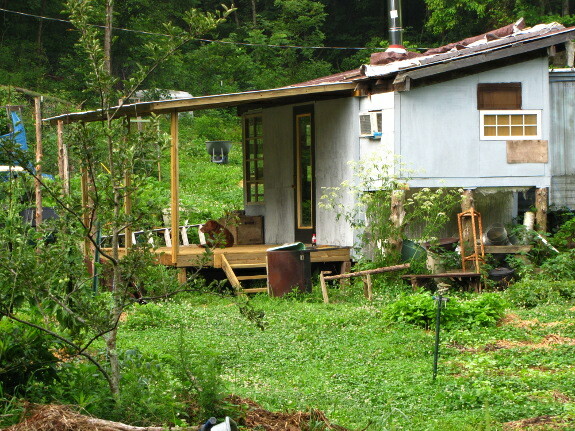 Speaking of wet, muddy ground, I'm starting to realize that Mark's right to put porches so high up on our priority list. It's amazing how much effort (and mental energy) has been drained over the years by slogging through the mud pit that develops over the winter in the area that's now under roof outside the East Wing. In addition to looking forward to the winter luxury of dry feet, we've enjoyed the summer luxury of cooler living conditions without the need for electricity during this current heat wave. But the most important benefit of the porches is harder to quantify and is due to the fact that porches make us spend a lot more leisure time outside. Stay tuned for the startling discovery that resulted from that outdoors time, coming up in tomorrow's post. Our chicken waterer keeps hens healthy so they can lay more eggs. Anna, I really need to come down and visit (I know that only a couple of blog (non-family) readers have ever been out your way . . . don't worry I couldn't find you without an invitation.) I love all of the infrastructure . . . all of the things that you live without and live just fine without (and would probably eventually get around to) - but really can push you ahead in terms of reduced hassle, new skills, and quality of life. Looking good! I love those porchs! your so lucky to have found such a talented helper. Charity --- We may have an open farm day at some point as part of the fundraising campaign for our Walden Effect Annex project. So stay tuned to the blog! It is important to improve your homestead. Working a homestead is hard enough without having to deal with being uncomfortable. We bought our single wide moble home for $5,000 and over the years have put over $10,000 into making it comfortable in our old age. This next summer we plan on re-doing the kitchen and putting in new rugs throughout. This is going to cost us mega bucks but well worth the $ since we will get more interest out of our investments in our homestead then if we leave it in the bank. Mona --- It sure does help to start with something cheap or (in our case) free. Then every little step makes life easier, and you aren't paying a mortgage in the meantime!